Years after its debut, Mission Control (formerly known as Exposé) remains one of Mac OS X's most distinctive features. 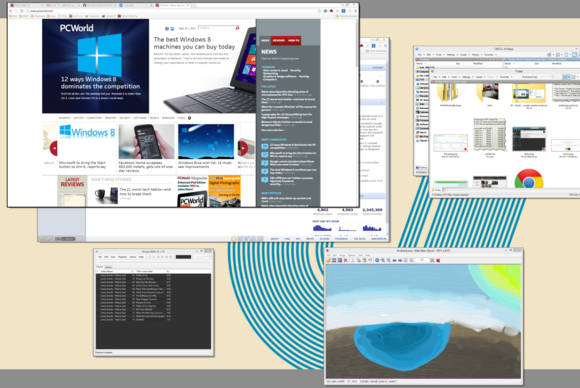 It allows you to to lay out miniature copies of all of your windows on the screen at once, making it both useful and pretty. Microsoft briefly experimented with a fancy task switcher of its own for Windows, called Flip 3D, but the feature was retired in Windows 8, along with the Start button and other familiar fixtures. It also introduced the Modern interface with its own separate breed of apps that defy the notion of a window. 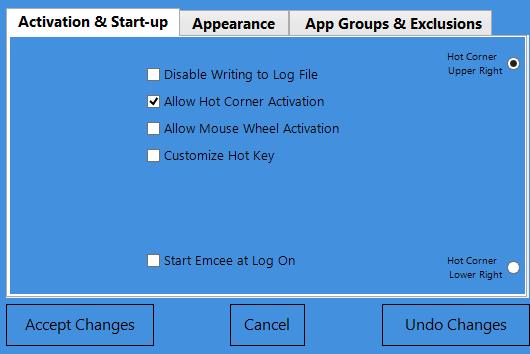 This makes it difficult to create an effective Mission Control clone for Windows, but Emcee for Windows 8 is one utility that rises to the challenge. As soon as you launch it, Emcee shows thumbnails of your windows. Emcee ($7.49, 14-day free trial) doesn't waste time: As soon as you launch its executable, all of your windows instantly shrink into a Mission Control-like display. 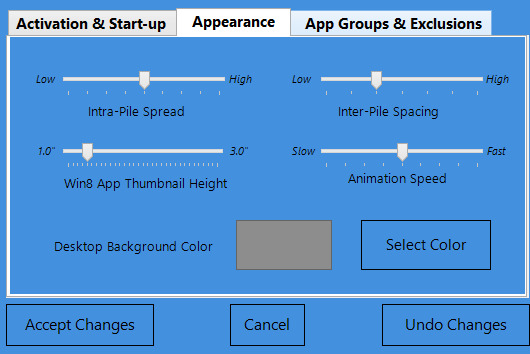 Any running Modern apps will also be included into the display, isolated into their own horizontal thumbnail strip at the bottom of the screen. Click any window or app to activate it, or hit Escape to abort the operation. Escape is one of the few keys that will get you anywhere with Emcee: It's a very mouse-centric utility. You probably don't want to manually launch Emcee every time you want to switch windows, and so it offers a number of other triggers, the easiest of which are hot corners. Place your mouse at the top or bottom right corner of the screen, and Emcee pops open. You can use either the top corner or the bottom one, but not both. Leaving one of the two corners free makes sense, since Windows 8 uses those corners for its own needs. Emcee plays nice with Modern-style apps, laying them out in their own strip along the bottom of the screen. Hot corners may be too convenient at times: I've triggered Emcee on while playing a full-screen game, and it overrode the game's display with its own. I was later unable to Alt-Tab back to the game and had to forcibly terminate it, making thousands of Sims unhappy. Other ways to trigger Emcee include hotkeys (Ctrl+Tab by default, configurable), and the scrolling the mouse wheel with the mouse cursor close to the top of the screen. Emcee's overview display is not just a bunch of window thumbnails: It employs intelligence to stack similar windows together. This can be as simple as putting all open Chrome one on top of the other, but you can also configure your own groups so that all open Office applications go together. 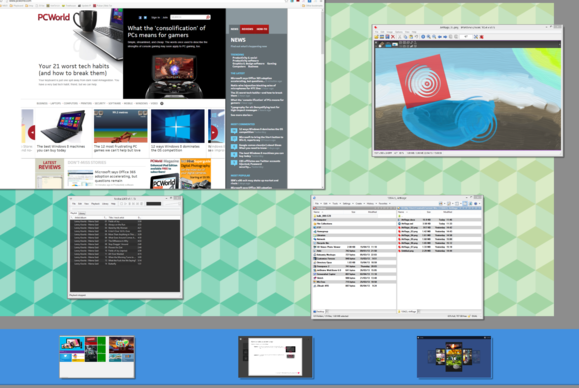 To flip through a stack of windows you only need to hover your mouse over the edge of any window you wish to see. Emcee doesn't display all windows: It was clever enough not to display miniature thumbnails of my Stickies, but also incorrectly excluded full-screen text editor WriteMonkey, and, inexplicably, Windows Live Writer, Microsoft's blogging product. Emcee offers a number of activation triggers, some of which are easy to trigger accidentally. Emcee is snappy, the thumbnails it displays are clear and easy to work with, and its stacks feature is simple to use. However, to become a truly useful everyday tool, it should include all relevant windows, as well as a way to quickly search through window titles using the keyboard. Until then, it remains a valiant effort to bring one of the Mac's most useful features into Windows. Emcee is quick and lean, but the lack of keyboard filtering and easy accidental activation keep it from becoming truly useful.